Gorgeous rovings and resulting yarn. Soooo, part of the answer was “spin.” I wasn’t home, so didn’t read your post and see the results until this morning. Nice job! Two big wins IMHO. The red stuff will fall into line. You are busy! I hope you enjoyed your weekend, except for the ripping out part, it looks like my idea of a good time. I love seing how roving becomes yarn and then a knitted item. I can’t wait to see how you decide to use your spinning and turn it into a finished item. You totally rock. So, any particular reason why you frogged the Flabella? I haven’t started either of the patterns from the January shipment yet, just wondering what about it turned you off. 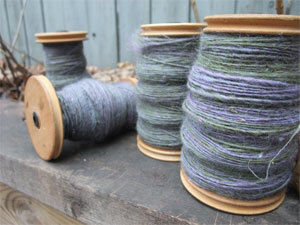 Lovely spinning work, by the way! Was it just the picture, or was that sock big enough to fit a giant? and is that why you frogged it? lovely spinning by the way! The yarn was mortified by the pattern name (since it obviously has a juvenile mind…), so deliberately messed itself up whilst you were knitting?? You secretly didn’t want to be foresighted and get ahead on the Sock Club schedule, but just wanted to spin and nothing else would do? Being a grownup’s no fun if you have to be sensible 100% of the time. Oh man, I love Fiber Optic. SO PRETTY. Good spinning choice. Did the Happy Go Lucky yarn read your March 22 calendar entry? To quote “It’s what I want and what the yarn wants. Resistance is futile.” That pretty yarn doesn’t really look like a “Flabella” (whatever a Flabella is). Perhaps it wants to be knitted in May or June when the sun is out? Your spinning is gorgeous! You made some pretty yarn. Remind us again what wheel you use. GORGEOUS spinning! I especially love the first one, yummy. I’m a very new spinner who’s currently discouraged by my own limitations, but now this lovely post of yours has turned it all around. So I’m coining a new term – SPINSPIRATION. Actually, now that I think about it, I’m sure someone else has come up with “spinspiration” before. But it’s new to me and I still <3 it. And I <3 your mad spinning skills. Lovely pics of the progress! No…can’t win em all. Woot. No surprises what you did on the weekend. The photos are beautiful. I do wish that you wouldn’t post about spinning. 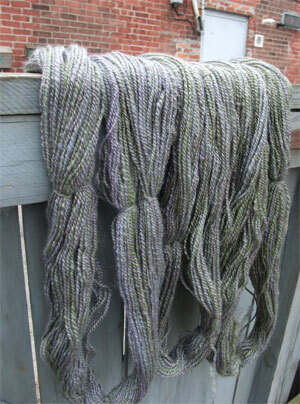 Your handspun is so incredibly beautiful, and I really don’t need another hobby. Sorry to see that the December socks didn’t go so well. The yarns you made are beautiful colors that blend wonderfully. How gorgeous!! Two out of three is not bad, not bad at all. The Fiber Optics yarn came out gorgeous! Nice! Nice! Nice, (and then, ouch)! Love the spinning! I can relate about the sock. I tried a toe-up pattern and disliked the technique, knit through the silent misgivings that the foot circumference was too large, knit the leg wondering how I would convince myself to make the second sock… thanks for the incentive to just rip out all that work. On the bright side, there must be a new sock pattern out there waiting for me to find it! Beautiful yarns, I just love them. Great job! Holy crap that’s a lot of gorgeous spinning! I just got back into the groove, and dude. It’s shearing season. Does anyone else hear, “DANGER Will Robinson!” in the back of their heads? I’m just swatching for Cascadia and I’m sure I’ll have to go down two needle sizes. Thanks for the reinforcement. Beautiful yarns! You inspire me to give 2-ply another chance. Also, 2 out of 3 ain’t bad, right? I love the first color of fleece! Gorgeous! It’s taken me three weeks to get to that point in my Flabella sock (and I’d bite my own arm off if I had to rip it back) and spin a mere 2 ounces of fiber singles! I am also knitting Flabella, and I went down a needle size to do it. So far so good, but set aside for the Olympic Sweater. The first row of bobbles was a real fanny-kicker! That pencil roving looks tailor made for your color loves… gorgeous yet subtly seventies kitchen! Hmm! I’m sure there is more to the Flabella story. Wow. Suddenly I feel very unproductive. Wow, no wonder you have a limp! All that spinning created gorgeous yarn. Dude. That STR is totally my color. You said so, remember? 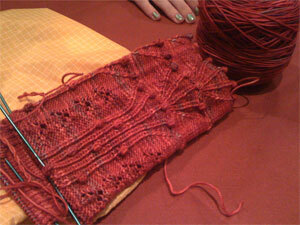 Your flabella looks lovely … but I’m sure the STR yarn will metamorph into something even more wonderful. Am in awe of your spinning! Wow. That’s a busy weekend! I’m also curious about why you frogged Flabella . . .
Can I just say – holy crap, dude. Ho. Ly. Crap. I feel like I accomplished nothing this weekend! I’m jealous of your productivity and beautiful yarn!! I, too, was flummoxed by the Flabella. It was thoroughly ripped back and replaced by Cascadia. Sock #1 is done and I’m on Rev. B of sock #2. Apparently, I was very uptight for the first sock and very relaxed for the second one. My solution is to knit the second one at work. I need to remember not to read your posts when you talk spinning because it just…I have resisted the urge to enter the world of spinners but honestly, your work is so gorgeous and the idea that I might be able to do it too is just… ACK!!! Get thee behind me, Stephanie! I can’t even KNIT as well as you do–what makes me think I could spin? Ok, so nobody has asked yet – who’s hands are in the Flabella picture – the ones with the blue/grey nail polish. Please don’t tell me they’re yours! As for me, a ball of Tencel Tape became 4 1/2 inches of Slinky Tree Bark Rib Tunic, and then became a ball of Tencel Tape again when I saw my side “seam” was 4 stitches off. Your post made me feel much better. Thanks! having seen the sock-turned-yarn-ball, i don’t feel so bad about having had to frog an inch or so of ribbing that was too tight to belong to any top-down sock of mine. luckily, a few hours of knitting later and 12 stitches bigger around, the sock now is 3″ long and actually goes far enough up my fatted calf to matter. respect the wisdom of the yarn, eh, stephanie? has anyone challenged you to create a beautiful garment by crocheting it? you’ve mastered two of the three major fiber arts. or maybe an afghan or something. I’m making the Cascadia pattern, personally. I think the toe is a little wonky, but that’s not MY fault… I think. Oh what lovely yarns you have!!! Meercy mercy that’s lot of lovely spinning. Whatever became of all the fleece you got at the Royal? Lordy they are sherring sheep now so look out if you go this year . Link seems not to have worked. You can check it out (if you wish) at my PictureTrail Knitting album. User name is “since61″. It was my first attempt at lace knitting & I’m really proud. Guess I should take a pic of the finished piece. Oh the first one! I love the colors! Beautiful spinning!! I miss spinning.. my knitting and crocheting and sewing just hasn’t left me any spinning time lately. I’m afraid I’m going to forget how to work my spindles! Wow! Those colors are all gorgeous. It’s very gray in the Y.O. (that’s Yonkers for you non-NYers)so these hues are a real treat. This is the first time I’ve made anything that you made (Flabella). I’m feeling so suddenly *cool*. But why the frogging? Size issues? This makes me want to learn to spin. So lovely! I don’t like the nups on a sock. It would be so tempting to reach down and try to pick them off!I’m knitting the other option. Such a great little story in perfect words and the perfect pictures. We can’t win all the time but with yarn we can live to knit again. If I had 1/10 of your energy my family wouldn’t believe how much I could get done. Lovely spinning. I can’t wait to see what they knit into. 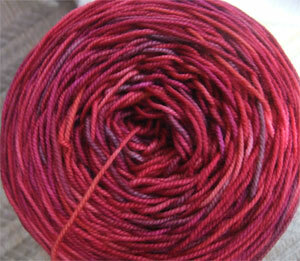 As for Flabella, your yarn wants to be Cascadia. Mine told me so and I’m glad I listened. I love them. Aha!!!! I read all the comments on Tina’s blog so I was prepared for the Flabella fiasco. I did mine in size small on 2.00mm. addi lace needles and they turned out beautifully-well, beautifully for me. They fit. Normally, I would knit a medium. I also spent the whole time thinking that the sock was inside out, but that was how it was supposed to look. It’s one of the pairs in my Christmas 2010 box and brings the total to 7 pairs. I might have time to bake in December!!!! What happened to the Flabella? Your spinning is just lovely, as always! Beautiful spinning! I wish mine looked that good. And went that fast, for that matter. I’m still working on the same stuff I started over a year ago…of course, every time I start suddenly there are forty tiny fingers poking at the spinning wheel, and four little voices asking if THEY can try it, and then they remember they haven’t eaten in, like, a whole entire MINUTE and plus they think someone took their Thing and also did they remember to tell me this long involved thing about something else they meant to tell me about and oh yeah, you hafta sign something that I think is in my backpack or possibly somewhere else in the house…why are you turning purple, mommy, are you sick…? I did Cascadia, and I think I’m taking mine apart too (they came out about two sizes too large). I think your limp is totally justified. Did you take time for food and drink? (What am I asking…of course you did!) Nice spinning! Oh. my. word. mother chaos. Getting a core workout from laughing. Pesterers set on kill… I think mine don’t even have a mere “stun” option. Stephanie – love the red. Sorry it wouldn’t comply, but everything else looks amazing. I dream that when my kiddos are fully self-cleaning/feeding/everything, I too will become super productive. I was just going to congratulate you on the amazing amount you got accomplished, but then I saw that last picture and spit red wine on my keyboard. Must go clean it. Your handspun looks beautiful, especially the first yarn. Flabella flumoxed me as well – at about the same point – something about those nubs and that size and I too wanted it to be inside out – all that sent me in search of something else and I found a pattern online called Tour de France – since my son is currently bicycle racing in France (in the minor leagues not the T de F) it just seemed right – suits the wool much better I think – now I will have to decide if they are for me or for the lovely lady who’s feeding and caring for my son as his host mother. hehe – the wheel of life. I rather love seeing the roving to yarn…my breath just goes all the way dooown and I sigh. Nice work. That is so pretty! Wow, you’ve really been busy. What an amazing transformation all done by your two hands and one foot! Maybe not gold but close to it! Pretty, pretty, pretty. Don’t feel too bad about ripping up the Flabella….I sorted out income tax papers all weekend…. Gorgeous spinning! And I am so delighted that you have once again shared your work from my favorite dyer Kimber at FiberOptics! She is quite a find! Can I come to your house and learn to spin??? I got a Lendrum for Christmas and am trying to learn, but I fear I am hopeless! 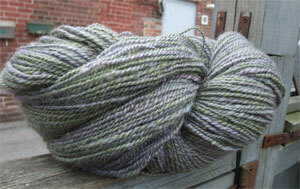 The yarn is gorgeous – lucky Denny! My Happy Go Lucky will be Cascadia when I get to it. Though I saw a post on Ravelry today from someone who make a lovely ruffled scarf out of it. And I have few new shawlette patterns that would probably show off the colors well. Who knows? I feel your pain of socks becoming balls of yarn. I did that over the weekend and have to do it again when my new needles come in. I’m doing two at a time, but thankfully I only did about 10 rounds before listening to the voice in my head saying “That’s too big!” If I’d done a whole leg (or two), I’m not sure I’d have had the strength to frog it. Whoa! You were busy! Love that STR colorway, and that sock looked great to me. I’m sure it will look even better re-knit! Well, clearly, the answer was spinning! 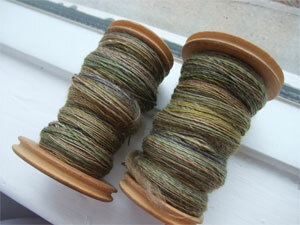 And spinning was quite successful! Where would there have been any sweater knitting time (Gansey calling notwithstanding)? I hate to start over, but ultimately I’m happy because I learned what was frustrating me the whole time I was knitting “wrong”. Then I just knit with nary a care, knowing that I now know. And… thank you for spinning. I can enjoy it vicariously. And that works for me, just fine! What a great productive weekend (that includes learning what you needed about Flabella). The Flabella didn’t go with the fingernails! Jeez, I don’t know why you didn’t see that to begin with…..
Dad would say that you have a “hitch in your giddyup”, after a pint it would be a “yitch in your hippygup”…..
Gorgeous yarns, as someone else said, you are a great spinsiration! Beautiful. I am going to do a sock club for myself… got a ton on sock yarn, patterns…. So happy to see you chose spinning, I love spinning posts! 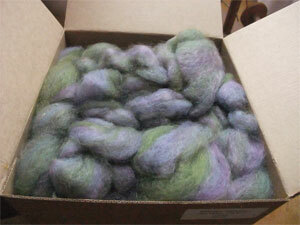 Sw merino/seacell is my favourite blend, and FIberOptic is my current favourite dyer for fibers. She gets it right for vibrant colours, autumn shades, and pastels. I’m not into the autumn spectrum for myself, but the colours in your fiber seem to have been handpicked just for you. Love the spinning Stephanie, every time I see photos of your ‘magic’ it makes me want to run out and buy a wheel and some ‘not quite yarn’…however, I am at least 5 hours from anywhere that I can buy a wheel, and that slows me down some. Love the STR, I am doing Cascadia with some adjustments…2.25 mm needle, medium toe stopping at the increases for the small, working the pattern straight. I get a nice small sock that fits like a dream. You are always an inspiration…I really have to knit faster. What was wrong with the sock? It’s sometimes hard to tell (beyond it was just not working for you). I’ll admit that I would have a hard time getting behind a pattern called Flabella. I am surely putting the emphasis on the wrong spot! Phew! I was feeling unworthy with all your spinning. But the knit & frog? Now there’s something I’ve done!–several times. Sweet products there Steph. I love the truth, makes me feel so much better to know you have to rip out something! Would you kindly show us how that first yarn (one-of-a kind colourway) knits up? I don’t like the clumps that you get with variegated yarn, but the two different coloured plies seem like they’d break that up. Good grief you’ve been busy. I started the Flabella last night, and THE SAME THING HAPPENED TO ME. 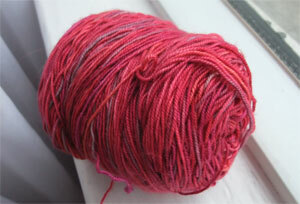 I decided to knit the club yarn into the other pattern, and I was using some Knit Picks kettle-dyed for the Flabella. I don’t even know what happened. I couldn’t get the stitch count right. Thankfully, I hadn’t gotten very far before I decided that ripping was in order, but it still hurt. Just casting on for the Flabella in Happy go Lucky…any words of wisdom? I’m sure it’s not pronounced as such, but perhaps there’s a psychological component acting when trying to knit “Flab” ella?? Related to an earlier post, Steven who gave you the socks at Detroit ( his pic is on your blog) is one of Natural Stitches’(one of our local, independant stores) faves. My son quietly reminded my DIL that she was getting twice the enjoyment for half the cost when she decided to “recycle” yarn from a project that just wasn’t shaping up right. Right now I’ve got a sweater I enjoyed making, but don’t like. The think it will soon be “recycled”. I am trying not to get the spinning bug. I already knit, crochet, cross-stitch, quilt, bead jewelry, etc. I really don’t need more hobbies, but your freshly spun yarn looks soooooo nice! Such beautiful results from spinning! Looks like your choice was successful! I ripped out my Flabella at that same place…it was HUGE! I started Cascadia and now I remember why I don’t like toe up socks. Wow, now I am excited all over again about working on Flabella. I admit to a deep and unexpected fascination with the bobbles. Lol. I think that last yarn wants to be a scarf instead of a Flabella. Or maybe a beret. I have some Madelinetosh sock yarn that decided it wanted to be a Ripple (by Wendy Bernard) beret. Tough going there bubbie! And the part about the knitting faeries, frogging your leggings!!! But nothing that two really fine beers won’t cure…eh? ps…Really amazing job you did on all that roving! Kudos!!! Holy Cow! You did all of that in one weekend? I am lucky if I take a shower, brush my hair and maybe do a load of laundry on the weekend. I think spinning was an excellent choice. Judging from the size of the box that one roving came out of, I recommend spinning more as it appears finished yarn takes less space than fibre in the raw! 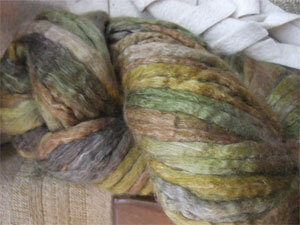 I am fascinated by the change in color from the roving to the spun yarn. The second batch is so much grayer than I would have thought. Something to think about. I’m confident you’ll knit something beautiful out of that Happy-Go-Lucky, so now worries, right? And I can’t WAIT to see what you knit from all of your beautiful handspun yarn. I’m jealous, I want it! Love the human hand included for scale! My mental map of Canada now includes giants wearing handknit socks. Hey, it’s just as accurate as most mental maps of Canada that you find south of the border. That second yarn could easily be one of the most beautiful yarns I have ever seen. I made the Flabella pattern too, and as difficult as those little bobbles were for me, I love the finished product. 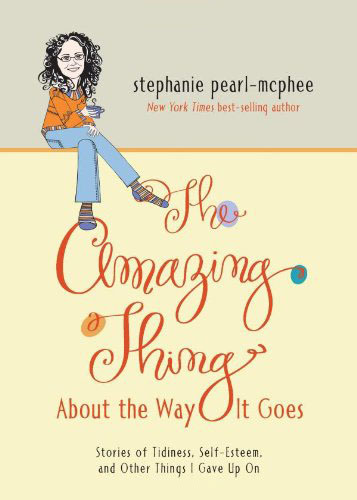 I’m wondering what went wrong with yours – just not feeling it? Guess spinning won out. Beautiful. Sock looked good too. Too bad it had some fault we could not see. hilarious! makes me feel a little bit better about my own frogging. what beautiful spinning! With a name like “Flabella,” you couldn’t have predicted that one? Lovely spun yarns, although I’ll have to admire the second one from over here, as mohair hates me. Hm, maybe I’ll spin tonight! LOVE the first yarn. The second one pretty, too. The third one is pretty, but I’m sorry it had to be yarn again, instead of the sock it was supposed to be. Thank you, SPM, for the enlightenment, and the “lightenment.” Just what I needed on a busy Tuesday! good GRIEF you get a lot done! Crikey! gorgeous. So inspiring, as usual! My vote was for spinning, looks like that was a good idea after all. I just ripped Cascadia — the gauge was way off…will have to go down a needle size and be more mindful of when to start the heel shaping. Was quite pleased with myself with how quickly the pattern knit up, though. Have you considered installing a double treadle kit? It’s all the yarn’s fault the sock got ripped. But the spinning — now those are gorgeous colors! It’s spinner’s foot, if you really are limping. What I often forget to do is get up and spend time walking around to loosen back up again. Lovely handspun! And thanks for the nudge — this reminds me that I’ve got a whole bin of roving and another of fleece betweem me and my goal of whittling the fiber stash down by half. Must…spin…faster…. October Frost is lovely; which there was a picture of the back, I love their description. October Frost is lovely; wish there was a picture of the sweater back, I love the description. Beautiful yarns. But I didn’t love Flabella a whole lot anyway. Socks and bobbles never seem to me to work to well once you’ve added feet and shoes. They get in the way. Note to Steven A. There are four, not three “arts” to consider, not only knitting, spinning and crocheting. There’s also WEAVING. I haven’t done it for years and years. It’s not terribly portable or storeable or moveable (I’ve moved 6 times in ten years) but it is satisfying, calming and the results can be so glorious. I miss it. Ripping is a hard thing to decide to do. Sometimes you just have to bit the bullit & go at it. Love the spinning. Good job. Love the Happy Go Lucky color! Wonderful transmogrifications. As a new spinner, I particularly admire the newly born yarns. Love the new yarns you spun. Denny is so lucky. Those are lovely. I wish I could spin that well. Molly and McGee’s second owlet Pattison hatched this evening at 6:47. All three are so beautiful! How funny…I was just thinking on my way to work this morning that you hadn’t posted any spinning in a while. And then…BAM…there it is. Beautiful! Two thoughts…better the sock than your handspun (which is lovely, btw), and that’s what happens when you brag about finishing the last pair 12 days ahead of schedule. You should know better by now! Hey Stephanie. I would love to get into spinning, but I’m at a loss as to where to start. What wheel options are out there? Is it something that should not be entered into lightly? Is it as hard as it looks? A spinning exposé is what I’m after. I’m open to any suggestions or hot leads you may have (to keep the journalism metaphor going). Cheers. Looks like you’ve been very busy spinning. Beautiful job! You just inspired me to pull out my spinning wheel again! Those yarns are to die for!!!! I love her book as well and have knit the Flyingdales out of Cascade 220 to gauge and while I love the sweater and it gets lots of wear at home…it doesn’t leave the house. Fits around the top but not the hips. Next time I need to pay more attention to the math…Oh there will be a next time. I love her stuff! lucky me. what do you want me to knit for you? crap I said it twice. May be I need to knit you 2 things eh? You were ready to spin after all! Beautiful roving, beautiful yarn. I know it’s hard to tell in pictures but the Fiber Optic yarn looks heavier than dk. Can’t wait to see it knitted up. Looks like a watercolor painting. I’ve never spun seacell. What’s it like to spin? Oh. My. God. That handspun is absolutely gorgeous. 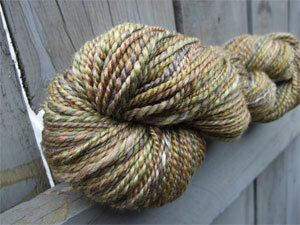 The yarn you spun from Sea Grass is so gorgeous! I’m completely in love. My STR isn’t going to be Flabella. . . something about the name. . . anyway, a nice scarf in such a lovely color seems right for me!